Interesting Facts – The Walking Liberty Half Dollar was introduced in 1916 to replace the Barber Half Dollars series, which concluded in the previous year. The new series was the result of a design contest for a new half dollar. The winner of the contest was Adolph A. Weinman, who was also the winner of a contest to redesign the dime. His new design for the half dollar was extremely popular and has become an iconic representation of America.The obverse design of the Walking Liberty Half Dollar features a full figure of Liberty in a flowing gown with an American flag draped around her shoulders. As the series name suggests, she is walking forward, appearing as facing left on the coin. One arm is outstretched and the other holds a bouquet of olive branches. The sun is rising before her with with inscription “Liberty” widely spaced above and “In God We Trust” behind her.The reverse design of the coin features an eagle facing left, perched on a rock ledge with a twisted branch extending. The eagle’s wings are raised in a stance described as defiant or perhaps ready to take flight. “United States of America” appears above with “E Pluribus Unum” to the left of the eagle and the denomination “Half Dollar” below. The Walking Liberty Half Dollar series contains a number of lower mintage dates which are considered key dates or semi-key dates. The two lowest mintage coins are among the 1921 Walking Liberty Half Dollars. The mintages for the Philadelphia and Denver strikes were 246,000 and 208,000, respectively. Other low mintage issues include the 1916, 1916-S, 1921-S, and 1938-D. Proof coins were struck for the series only from 1936 to 1942. 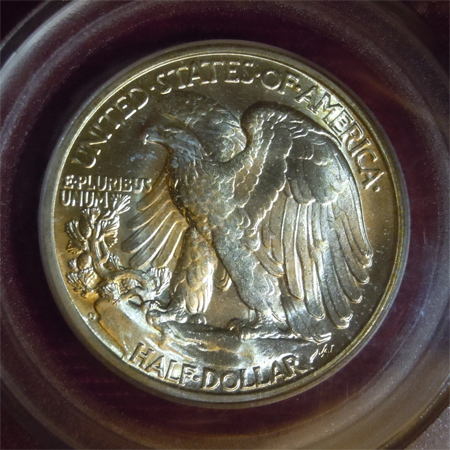 The mintage for the first proof issue was a mere 3,901 coins, but the figure steadily rose each year until 21,120 proof coins were minted in 1942. After that year, the production of proof coinage was suspended. The Walking Liberty Half Dollar series concluded in 1947, when it was replaced by the Franklin Half Dollar. This design change also completed the transition from depictions of Liberty on circulating American coinage to depictions of historical Americans. The Walking Liberty design was later used on the American Silver Eagle bullion coin series, which began in 1986. Walking Liberty Halves, Walkers as they are frequently called, are heavily collected due to their beauty. They hold great appeal for traditional collectors as well as non collectors. Over 485 million of these coins were produced between 1916 and 1947 with many that still exist in MS65 condition or better. A full set of 65 different date-and-mint combinations can be bought for around $1000 in average circulated condition (AG-VG for earlier years and F to XF for later years) making this series achievable for many collectors. As always, coins in higher grades and mint state condition will command huge premiums. You can also start with what is called the short set with are coins dated from 1941 to 1947 which is 20 coins. Acquiring these in better grades can be very rewarding. One thing to look for in high grades is weakness of strike. Most dates are weakly struck, particularly on Liberty’s left hand and leg, head and skirt lines and on the eagle’s breast and leg feathers. 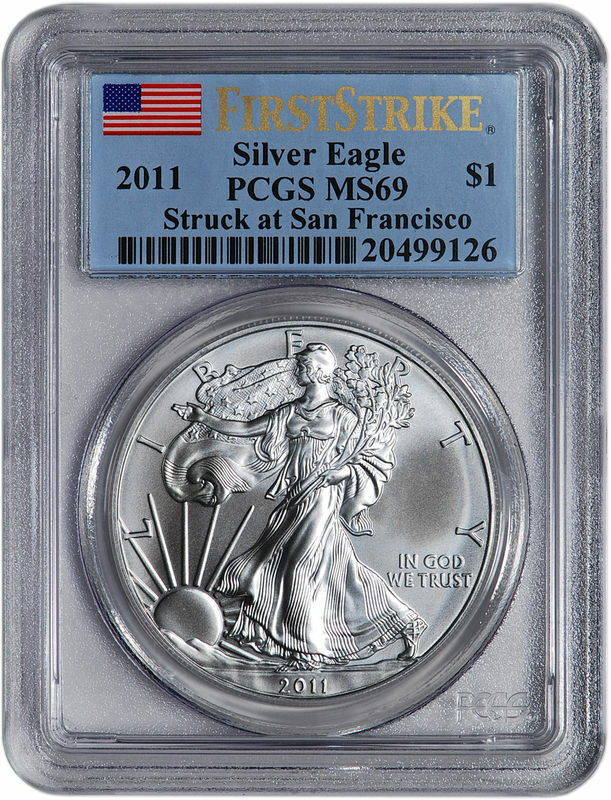 As you would guess, sharply struck coins typically demand substantial premiums. An effort to improve this issue was attempted by Chief Engraver George T. Morgan in 1918 and again by Assistant Engraver John R. Sinnock in 1937 and 1938. None of the revisions seemed to help though as later issues were still weak in the central parts of the design. Places to check for wear and weakness include Liberty’s head, breast, arms and left leg and the breast, leg and forward wing of the eagle.